After years in Moscow, I have yet to find a Chinese restaurant as good as the take-out near my high school west of Chicago. A strange fact about Moscow is that there are very few authentic ethnic restaurants (unless you count Azerbaijani or Georgian). What I mean is a Mexican restaurant run by Mexicans, a Thai by Thais, a Chinese run by Chinese. Few among the hundreds of Japanese restaurants Moscow even have a Japanese sushi chef. At best, they are from Russia’s Buratiya autonomous region. TAN, located on that west-bound side road that runs along the Garden Ring just near Mayakovskaya metro station, is not exactly hidden, but I had never noticed it before, despite the large orange sign facing the street. The entry and the restaurant are smartly decorated in Chinese elaborate, and it is spacious and clean. When I entered, TAN was quiet and near empty. Upon sitting down, I was given a delicate teacup full of white flowers and colorful accents. Then the Chinese tea pourer arrived and began an elaborate show with his brass hot water pot, which had a thin, sharp straight spout that seemed about two meters long. Dressed in a starched white martial arts outfit, he grabbed the cup and began to swing the pot around like a samurai sword, never losing a drop of hot water. With a last stroke that brought the spout across his back, he leaned over to fill the cup he had laid on the floor. The tea was Pau-Pao (110r), made from chrysanthemum petals, Chinese dates, barberry, raisins, green tea, jasmine, and walnut kernels, and sweetly delicious. 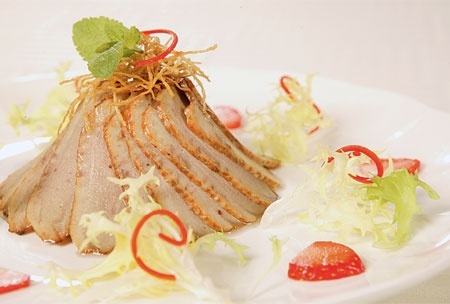 We opened the thick menu, which begins with a page devoted to each of four house specialties — abalone, swallows’ nest, shark fin, and trepang (sea cucumber). These are followed by Beijing Duck (1200r). We selected a broad sample of TAN’s staples, starting with Beef in Chili with Garlic Sichuan Style Sauce (450r), Lamb with Cumin (520r), Chicken in Hot Sauce with Peanut (420r), Crisp Royal Shrimp with Almond (710r), Scallops in Oyster Sauce (630r), and Pork Ribs on Lotus Leaves (510r). For vegetables we tried Fried Celery with Cashew (380r) and Saute of Broccoli and Chinese Vegetables (460r). We also ordered a plate of Fried Udon Noodles (390r) and white rice (40r). The wine accompaniment was Hugel Riesling 2001 from Alsace (2900r), a good choice for TAN’s mildly spicy menu. As the dishes were brought out and served, several stood out. The pork ribs were dressed with a dark, sweet sauce and covered with mounds of chopped peanuts in a light sweet sauce. The peanuts alone made the dish, but the ribs were also excellent. The scallops were a special order, and they were huge and tender set in a shallow layer of rich oyster sauce. The shrimp had been breaded with a thick layer of sliced, blanched almonds before being fried. The almond coating was crisp, and a great contrast to the large, soft shrimp within. The fried celery was a simple treatment, lightly pan fried with large cashews but still just crispy. There should always be room for dessert, in our case Carmelized Pineapple (40r/100g) and Carmelized Strawberry (80r/100g). The memories of the Chinese takeout from my suburban American youth remain the yardstick by which I judge, perhaps unfairly, Moscow’s Chinese restaurants. However, several dishes at TAN made a strongly positive impression, and the tea service was a remarkable and pleasant highlight. I won’t hesitate to return.